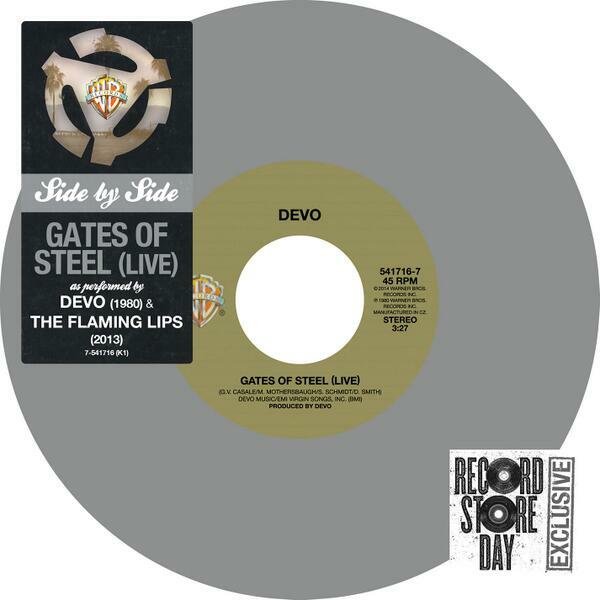 Devo and The Flaming Lips “Gates of Steel” split is #2 on Billboard’s vinyl Hot Singles Sales chart for the week ending April 20th, leading the four 7″ in Warner Brother’s Side by Side series that charted in the top ten. The overwhelming success of Record Store Day 2014 counters criticisms of the day raised by some store owners and vinyl distributors in the past few weeks. Sales and chart details have been posted here; streams of top sellers here. 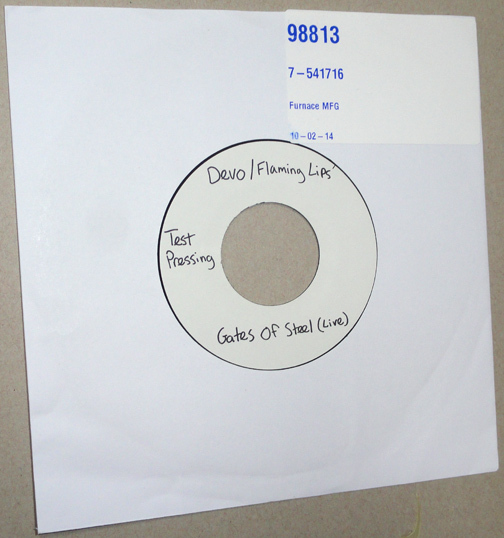 on silver 7″ vinyl in single pocket jackets this Record Store Day, April 19th. Part of Warner’s “Side By Side” series, the Lips version is paired with a 1980 recording of the same song by DEVO from the original DEV-O Live EP. The split is a tribute to DEVO guitarist and founding member Bob Casale – better known as “Bob 2” – who died of heart failure on February 17, 2014. 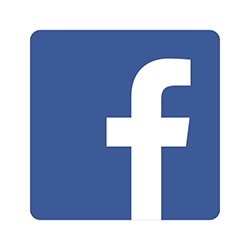 Remembrances of Bob have been posted here. Also out April 19th, The Flaming Lips are releasing a vinyl edit of “7 Skies H3″ (full details here) and a reprint of their classic “I drank blood with God” T-shirt. Michael Ivins explained the band’s idea to release test records as well, though that plan was shelved for Record Store Day 2014.